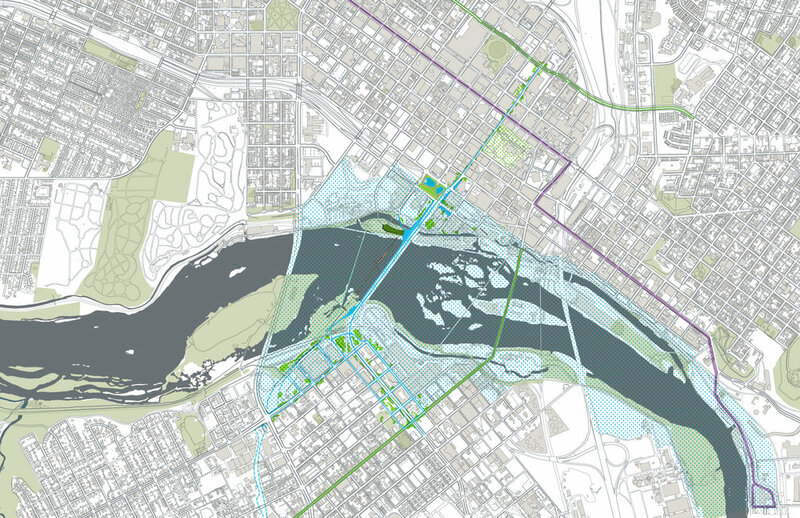 BridgePark is a proposed linear public park that would span the James River and connect the riverfront experience to the City Center, on both sides of the James. The park would transform 9th Street (including a portion of the Manchester Bridge over the beautiful James River) into a world-class destination for biking, walking, art, education, events, and community engagement. BridgePark stretches from Leigh Street in the north to historic Hull Street in the south over a two-mile journey past some of our City's most significant sites. The path includes VCU’s downtown campus, the John Marshall House, the State Capitol, Kanawha Plaza, Brown's Island, the Manchester Climbing Wall, and the fine grain of the South side’s historic streets. The park would stitch the two sides of downtown together, effectively linking both the historic Jackson Ward and Manchester neighborhoods to the river, and to each other. Richmond has a one-of-a-kind wealth of historic and natural resources, with the beautiful James River at the heart of our City. BridgePark will connect our shared stories, our key destinations, and some of our most beautiful neighborhoods, all along a bike-able, walkable, beautiful pathway and series of park spaces. The Richmond BridgePark Foundation has completed its Vision Stage with a world class team of professionals led by Peter Culley, principal of architecture firm, Spatial Affairs Bureau, Wolf Mangelsdorf, Group Director of structural engineering at Buro Happold, and Michael Flynn, Director of City Strategies at Sam Schwartz Engineering. The Foundation continues historic levels of community engagement about the project, including workshops, stakeholder meetings. neighborhood meetings, and City-wide public meetings. A 28’ long physical architectural model designed and built by the Spatial Affairs’ team in conjunction with VCU students and other creatives in the Richmond community is currently on traveling exhibition at various sites around Richmond and the wider community. Concurrently, the Foundation is working with a cost estimation and phasing analysis team at Gardiner and Theobald in New York. Meetings also continue with senior members of the planning and economic development teams at the City of Richmond and state and regional planners as BridgePark enters the implementation stage. Richmond BridgePark Foundation is a registered 501(c)(3) non-profit, organized to catalyze the community around this idea. Your donation goes directly to our planning and educational programs.